When the Rochester Royals selected Nate Archibald in the 1970 NBA Draft, it seemed destiny had a plan for the former Harlem standout. Heading to Rochester meant the young point guard would be paired with Coach Bob Cousy – a legendary point guard during his own playing days with the Boston Celtics. The coach and former Celtics star, who at the time held the record for most assists in a game (28), instilled in Archibald a team-first mentality that was easily recognizable on the court. In 13 seasons in the League, Archibald averaged more than seven assists per game and over 11 per contest in one season. Yet, Archibald’s exploits on the court were not limited to his ability to pass the ball. Slashing through the lane, “Tiny” also earned the nickname “Nate the Skate” for his ability to penetrate. With a career average of more than 18 points per game, Archibald proved his dual offensive potency when he became the first and only player in NBA history to lead the League in scoring and assists. During the 1972-73 season, at the age of 24, he cemented his legacy by averaging 34 points and 11.4 assists per contest. 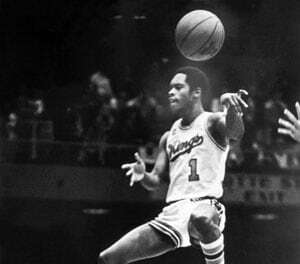 Despite his significant output, Rochester traded Archibald to the N.Y. Nets in 1976. After a brief stint in the Big Apple, he joined the Boston Celtics. In 1981, Archibald won his first NBA title – playing alongside the likes of Larry Bird and Kevin McHale. By the culmination of his career, he had left a giant impression on the League. A six-time All-Star, All-Star Game MVP and NBA Champion, Archibald stands as one of the best point guards to have played the game, and his No. 1 jersey hangs in the rafters of Sleep Train Arena.